The illustrated buildings at wqc/tallest are from my own research done in 1995-6. I did reasonable research then, and the hardest part was finding the buildings earlier than the Washington Monument. Yes, the list of world's tallest building title holders does appear quite short, but I don't think any other building(s) can be added prior to the Eiffel Tower. (For the record, the spire of Beauvais illustrated is just an 'imaginative' reconstruction by myself.) R. may be correct about some NYC building competing with the Chrysler Building during construction. What I think would be also interesting is to add scale drawings of the type of jet planes that crashed into the WTC Towers, and at the same time mark the elevation of impact of each tower. Has the "exact" elevation of each plane impact ever been published? I'm very glad that you mentioned "Beauvais's overreaching collapse." For the benefit of all, Beauvais's St. Pierre Cathedral spire (c. 1570s) was the first building to exceed the height of the Great Pyramid at Giza, which until then remained the tallest building in the world. Unfortunately, the Beauvais spire fell after standing only approximately 75 years, however, the main vault of the catherdal is still the highest stone arch in the world. One could then say that the Great Pyramid regained its "tallest" status, except by that time the second pyramid of Giza may have already been taller than the Great Pyramid (like it is today--this differential is due to the great Pyramid's full point no longer being there). Regardless of whether the Great or second pryamid held the "world's tallest record," neither was surpassed until the 1850s when the Washington Monument reached the height of 555 ft. What I find most interesting is that after more than four millennia of the pyramids holding the world's tallest title, they were uncannily surpassed by another ancient Egyptian form! As those wonderful ancient Egyptian cheerleaders used to say, "Ra! Ra! Ra!" It has always fascinated me that the Great Pyramid in Egypt was the tallest building in the world for over 4,000 years, and that it is also one of the oldest buildings in the world. 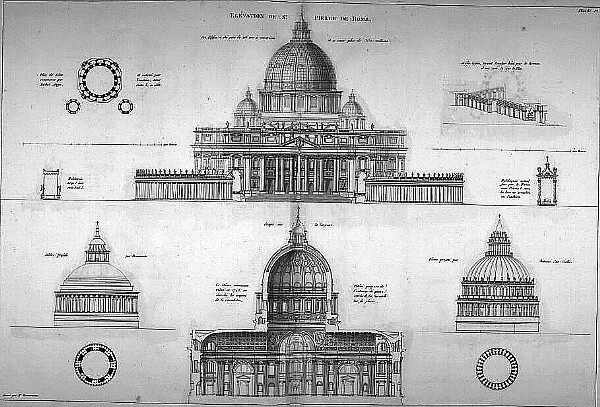 Of further fascination is the fact that one of the few buildings to ever come close to the great pyramid was Michelangelo's basilica and dome at St. Peter's in Rome. Symbolically, it intrigued me that the ancient rivalry between old Egypt and monotheism should play itself out in two enormously monumental buildings. The practical lesson here, however, is again about scale, and specifically the history of height in architecture. Today we are, in a sense, spoiled by high buildings and do not realize how rare tallness in architecture is when the total history of architecture is taken into consideration. To me, the fact that the Pyramids will most likely forever hold the record of the world's tallest building for the longest amount of time gives it an added significance, a place in architectural history that no other building is likely to supersede. Using the Great Pyramid as the prototype then, for the world's tallest building, might provide insight to an analysis of the world's tallest buildings of the last two centuries. I should at least find out what buildings they were. I already know what the last three tallest buildings are: Sears Tower, Chicago, the World Trade Center, New York City, and the Empire State Building, New York City. The Great Pyramid of Cheops was originally 146.4m (480 ft) high. 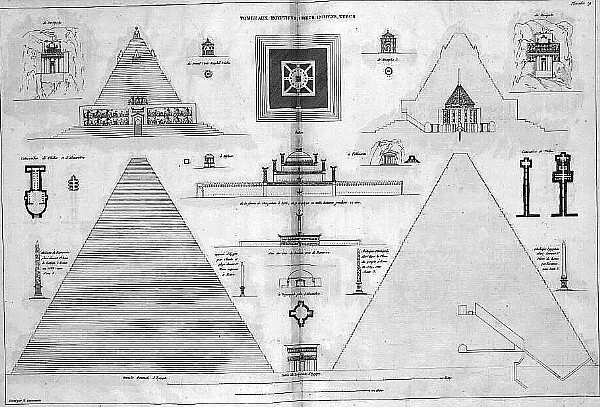 The Pyramid of Chephren was originally 143m (470 ft) high. The height of St.Peter's in Rome, from pavement to top of cross, is 452 ft. Up until now I had no idea that the second pyramid was also taller than St. Peter's in Rome. This makes me wonder what building finally broke the Pyramid record. This research as brought many new things to light and I feel I have a much better understanding of the history of the world's tallest buildings. I find it interesting that the short lived spire at Beauvais was the first structure to surpass the Great Pyramid in height. Another interesting fact is the seeming limit in height around 500 ft., and how the new limit seems to be something over 1000 ft. The other thing that fascinates me is the fact that the structure after the failed spire at Beauvais to finally surpass the pyramids is the Washington Monument in Washington D.C. The great irony is that the pyramids were finally surpassed by an obelisk. In any case, two ancient forms are still among the tallest structures in the world.